This Dar Olalla glass rods table lamp in polished chrome with ivory shade is bright and classy. A 1920’s inspired table lamp, with circular polished chrome base and top cap holding vertical glass rods that form the body. 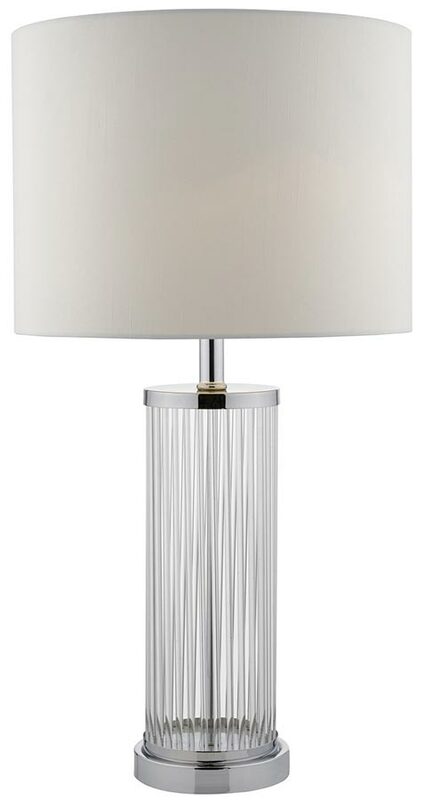 Supplied with a white lined 14″ ivory faux silk drum lamp shade and fitted with a convenient inline rocker switch. This beautiful 1920’s style design will complement a wide range of styles and will instantly update any room in which it is displayed. A class 2 double insulated table lamp, no earth required. Dar lighting is widely recognised as one of the leading suppliers of a full range of innovative, quality lighting products such as the Dar Olalla glass rods table lamp you see here.